Other Common Names · Oduvanthalai/Nillipalai (Tamilnadu and Pondicherry); Kadishe (Andhra Pradesh ); Karlajuri (West Bengal); Garari (Hindispeaking States of India). Botanical Name · Cleistanthus collinus. · Oduvanthalai/Nillipalai (Tamilnadu and Pondicherry); Kadishe (Andhra Pradesh ); Karlajuri (West Bengal); Garari (Hindispeaking States of India). · It is a small, deciduous tree with spreading, smooth branches. 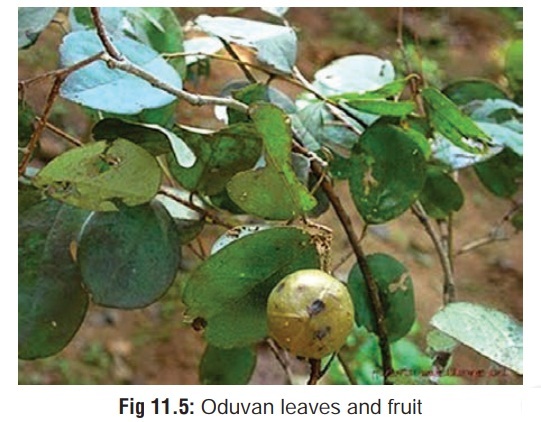 Leaves are orbicular, broadly ovate or elliptical, with rounded tips (Fig 11.5). · Flowers are borne in small axillary clusters. · The fruit capsule is large, somewhat trigonous, woody, dark- brown, and appears shining and wrinkled when dry. Seeds are globose and chestnut-brown in colour. · All parts of the plant are poisonous. · Extract of the various plant parts yield a multitude of compounds of which the glycosides, arylnaphthalene lignin lactones are toxic. These lignan lactones include cleistanthin A and B, collinusin and diphyllin, which in the past were known collectively as “oduvin”. · In one Indian case series, clinical features in those who died included vomiting, epigastric pain, breathlessness, visual disturbances (clouding/blurring/coloured vision), giddiness, drowsiness, fever, tachycardia, hypotension and/or respira-tory arrest. Survivors were asymptomatic, or transiently symptomatic with abdominal pain, visual symptoms and giddiness. · A recent case report highlighted ARDS, distal renal tubular acidosis, and distributive shock secondary to inappropriate vasodilatation. · Neuromuscular weakness at presentation has been docu-mented. · ECG changes may include QTc prolongation and non-specific ST-T changes. · Blood biochemistry may reveal hypokalaemia, increased AST/LDH/CPK/CPK-MB levels, hyponatraemia, hyper-bilirubinaemia and elevated urea levels. · ABG may show evidence of metabolic acidosis, hypoxia, and a widened alveolar- arterial O2 gradient/difference (A-aDO2 gap), especially in those with respiratory failure. · Correction of metabolic acidosis with sodium bicarbonate. · Correction of hypokalaemia with IV potassium chloride. · N-acetylcysteine 150 mg/kg over 1 hour, followed by 50 mg/kg over 4 hours, and 100mg/kg over the next 16 hours, has been suggested as beneficial. Cases of suicide accomplished with parts of the Oduvan plant have been on the increase in recent times, in several parts of India, especially Tamil Nadu and Andhra Pradesh. Accidental poisoning has also been reported.